Conrad Glantz [b. 1860, d. 1921] and Amelia Hahn [b. 1856, d. 1946, m. 1882] immigrated from Norka, Russia to the United States in 1892 settling in Culbertson, Nebraska where Conrad's brother, John Glantz, had immigrated years before in 1876 at the age of 18 (according to John's great granddaughter Louise Christina (Glantz) England). Another of the brothers, William/Wilhelm Glantz came to the United States about 1900. Conrad Glantz was the son of Conrad/Konrad Glantz [b. 1822, d. 1878] and Margaret/Margaretha Yost/Jost [ b. 1823, d. 1871, m. 1840]. Conrad/Konrad Glantz was the son to Heinrick Peter Glantz [b. 1786, d. 1843] who was married to Elisabeth Eckert [b 1792, d. 1852, m. 1821]. Heinrick Peter Glantz was the son to Johannes Glantz [b. 1746-1747 d. 1809] and Christina Vogler/Volcker [b. 1745-1750]. Johannes Glantz was the son of Ernst Glantz and Ester Jacoby as shown on the Pleve Chart from Russia. Conrad and Amelia journeyed from Culbertson, Nebraska to Loveland, Colorado around 1901 following the growing sugar beet industry and the opportunities provided for farmers. Around 1919 they moved to Berthoud, Colorado. Their children mostly stayed in the same general area (Loveland, Berthoud, Longmont) except Rose who moved to California. One daughter, Lydia lost her eye sight and eventually lived in Denver, Colorado. 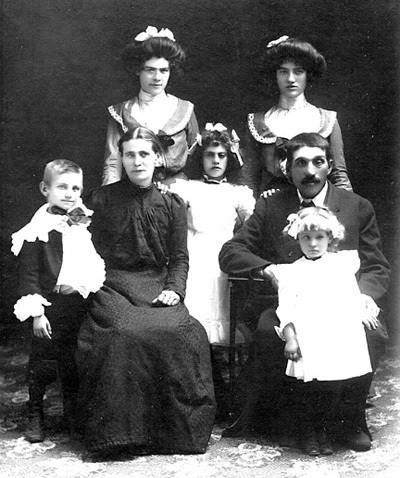 The Conrad and Amelia Glantz Family. Back row: Elizabeth and Carrie. Front row: Daniel, Amelia (mom), Lydia, Conrad (father), and Rose Glantz. Courtesy of Jan Boespflug. ​The Glantz Family continue to live in various areas of the Front Range of Colorado. Several of the generations continue the farming tradition, including sugar beets. I am the granddaughter of Elizabeth Glantz and Henry Yeager and have been working on the family genealogy for a good number of years. In 1998 I began working with six of Dan Glantz's daughters who had also been working on genealogy and our project grew. I began this journey and my goal was to have everyone's data. However, my journey grew in to a longing for more than names and dates. As I began getting acquainted with those who came before me, met new family members or became reacquainted with others my longing turned my heart to much more. I discovered roots which ran deep and built the foundation of a family. A family blessed by our ancestors who gifted us so much by coming to the United States. Information and photographs contributed by Janet "Jan" (Yeager) Boespflug (August 2003).